The above screenshot is what my Luminance data looks like after a few nights of imaging the same object. In this particular image I was shooting LRGB with a mono camera. So this is just one filter. But the process I’m about to describe covers removing light pollution from any image. This could be light pollution from your DSLR, Color Astro camera, or a mono camera just like the one I used. The first thing you should have done was integrated and calibrated your images that you’ve taken. See here for a tutorial on that. After integration you’re left with a single color image in the case of a DSLR or Color Astro camera. Or you’re left with multiple mono channels that you’ll later combine into a color image if you used a mono camera. Now for the light pollution removal. Double click your integrated image at the bottom of the files list. This loads it as the current selection. 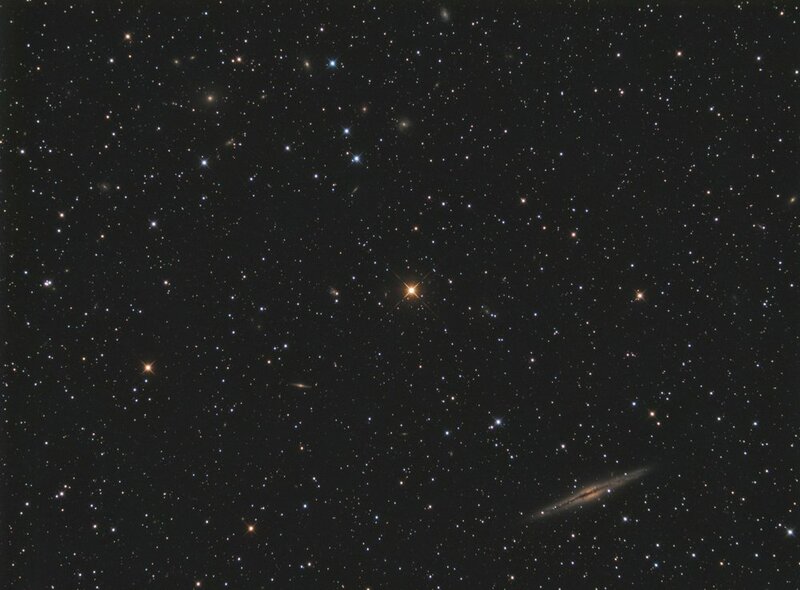 Now select the 9) Tools tab on the left column, and press Remove Light Pollution. If you want to do a quick and dirty job removing the light pollution, you can use the cursor to “draw” green boxes on your image. Try to draw a grid of them across the entire image excluding parts where you want to retain detail. In this case, I avoid the area around the large galaxy in the lower right. The issue with this method of drawing large boxes, is the algorithm that is used to remove the light pollution from this grid means it does so with very little variance across the removal. At first glance, it looks like it did a pretty decent job. But on closer inspection, you can see a light ring around the center, and brighter edges along the right hand side. They are very subtle, but defiantly there, and you can even see them better when the image is enlarged inside Astro Pixel Processor. So, how I get around this issue is I create lots of tightly packed boxes instead of a few large ones. This alternate method creates a fine pattern for the algorithm to detect and remove the gradient with more subtle finesse. This method is a lot more time consuming, but produces perfect results. If you look closely, you’ll see I avoided drawing boxes around the brighter stars, small galaxies and the large galaxy. But now, I’ve been able to provide a lot more granular detail on the areas where I want the light pollution removed. After placing your grid, press the calculate button. Don’t worry about any boxes that change colors to red or yellow. Then press the OK & Save button. Give your image a new name, so that you don’t overwrite the original. This way, if you’re unhappy with the results, you can attempt it again. Now I have a perfectly corrected image with no light pollution. If you’re using mono, I suggest you perform this light pollution removal on each channel independently, then combine them into an RGB image only after the light pollution removal. Your end result will look fantastic. You might be asking now, what about a narrowband image that has light pollution? With all that nebulosity, they’re a lot more tricky. You can’t draw boxes all over those images, as you’ll more than likely remove nebulosity from your image. While narrowband does work wonders in a light polluted sky, it cannot eliminate all of the light pollution. So, at times, we’ll have to apply some light pollution removal to those images. I start with an image like the above. There is some light pollution that I can see, maybe even some humidity in the air that creates a brighter spot towards the middle. All of this can be removed with this light pollution removal tool. To start the process, identify a few areas that appear to have no or little nebulosity, and draw a few small boxes in those ares. This is going to be a multistage process. As we start to get a few boxes in there, we’re going to go ahead and press the calculate button, and APP will remove a layer of light pollution. This should reveal some other areas where nebulosity is light or non existent that you can now add more boxes to. We’re going to repeat this process, adding boxes, and pressing calculate until we think we’ve removed all the light pollution without effecting our nebula. When you’re satisfied you’ve removed as much light pollution as you can and avoided damaging the nebulosity, you can press calculate one last time and then OK & Save the image. The end result is a well corrected, light pollution free image.